Indian Prime minister Narendra Modi's election promise of reducing corruption and putting babus to work seems to be reaping dividends for India, as China has been ranked more corrupt than India for the first time in 18 years. According to reports from Transparency International's annual survey, India has managed to improve its rankings after the new government came to power in 2014. India has managed to jump 10 places to rank 85 out of 175 countries and China dropped 20 places to rank 100. This can be attributed to Modi's campaign against corruption, newer laws that curb malpractices and also the anti-corruption movement by Anne Hazare that led to formation of Aam Aadmi Party. The Corruption Perceptions Index measures the perceived levels of public sector corruption worldwide, and it paints a rather scary picture. 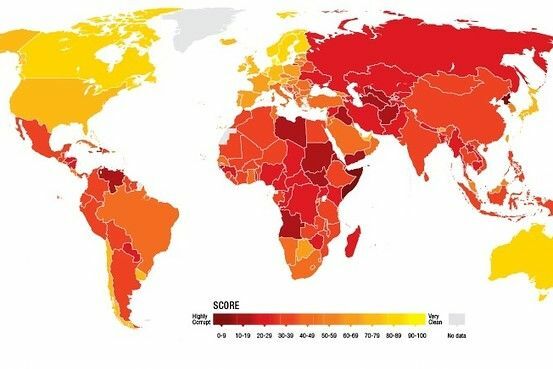 The company claims that not one single country gets a perfect score and more than two-thirds score below 50, on a scale from 0 to 100, 0 being highly corrupt and 100 being very clean. A country or territory's rank indicates its position relative to the other countries and territories in the index. The Berlin-based watchdog has surveyed multilateral banks, big foundations and other international institutions about the level of corruption in different countries to come up with its annual Corruption Perceptions Index which was used for the rankings. Did India actually ace against China? No, India actually managed to just increase its ranking by 10 spots, which is a positive sentiment for the corruption-laden country. But it was China's fall by 20 spots that can be attributed to the current scenario of comparison between two Asian juggernauts, whose economies have been compared quite often. According to WSJ, China slipped below India after losing more ground than any other country in the rankings and this is the first time China has been ranked below India. It seems the percentage of corruption has increased in Republic of China that has given India, an advantage to better its rankings. With all the calculations, China would still be ahead of India, if it would have managed to keep its corruption index in check for 2014-15. Meanwhile, the Modi government still has its work cut out to reduce corruption by more spots to get better rankings in World Bank's Ease of doing business reports. Denmark ranks first followed by New Zealand and Finland. #FlashBack: Salman Khan-Sanjay Dutt starrer Dus was never completed. But what was it about?